The papers of Nobel Prize winner Daniel Nathans, MD, are now part of the National Library of Medicine Web site, Profiles in Science. Nathans (1928-1999) was a pioneering molecular biologist. He won the 1978 Nobel Prize in Physiology or Medicine for his innovative use of restriction enzymes in analyzing virus genomes. Nathans earned a medical degree and through his mentors became drawn to the world of laboratory research. He pursued an academic medical career, combining teaching, research and patient care. 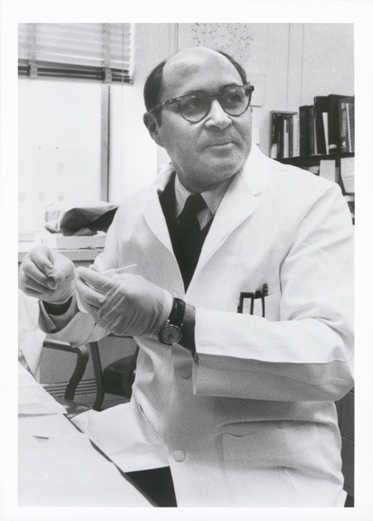 He joined the faculty of the microbiology department at Johns Hopkins University in 1962 and became director of the department 10 years later. Widely acknowledged as a first-rate researcher, teacher and mentor, Nathans was also an able administrator—thoughtful, fair and deliberate. He was director of the Microbiology Department at Johns Hopkins University from 1972 to 1982, and served from 1981 to 1999 as Senior Investigator of the Howard Hughes Medical Institutes unit. A member of many national scientific committees, he was Interim President of Johns Hopkins University during 1995-96, guiding the institution through a period of difficult transitions. Profiles in Science celebrates 20th century leaders in biomedical research and public health by making their archives available to the public. The site features correspondence, published articles, notebook excerpts, photographs and more from the archival collections of prominent scientists, physicians and others who have advanced the field of science and medicine. With the addition of the Nathans papers, the Profiles in Science collection has expanded to include 30 prominent researchers, public health officials and promoters of medical research. February 4, 2010 in People, Products.